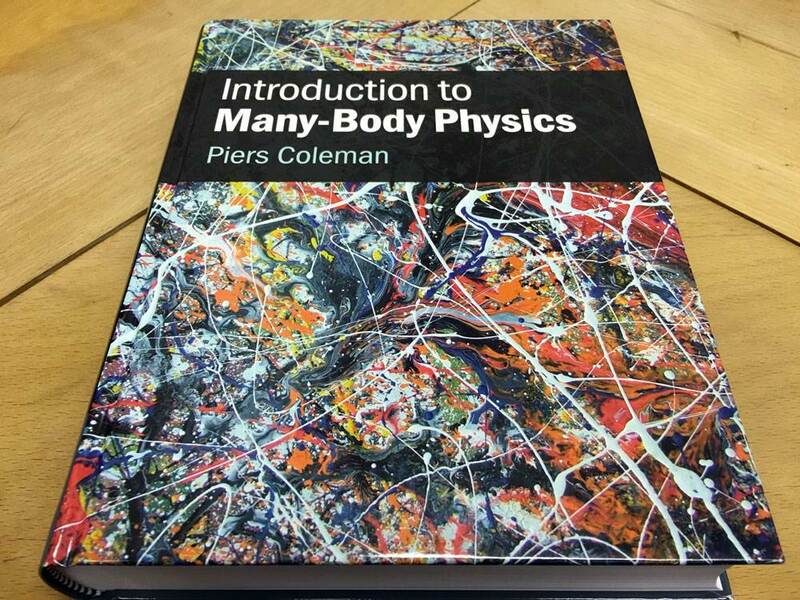 Three years have passed since I got the email asking to use one of my paintings for an academic book called ‘Introduction to Many Body Physics’ by theoretical physicist Piers Coleman. This, for me, is one of the single greatest moments I have experienced so far. And, for what is just a book, please let me explain why I’m so proud. I got a call from Cambridge University Press back in 2012 about using this particular painting for the cover of the book. Someone had seen the image of the painting on the web and thought it would fit perfectly. 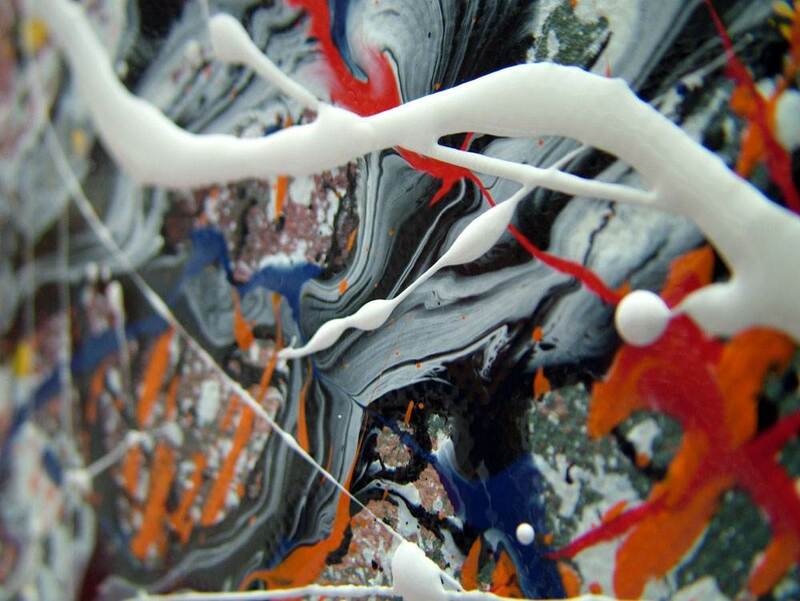 The initial request was to provide an image of some of the the close-up details (there are many on this painting). No problem, image sent. At that point Piers Colemans’ book was awaiting publication from, and please correct me if I am mistaken, a published paper on quantum fluids and condensed matter (stay with me). In the years that passed I did everything I could to get hold of a copy but never managed to track one down. Even CUP couldn’t help as no-one was really sure whether it was actually available or not. So I waited patiently. Then a couple of weeks ago I got an email asking if I would like a copy – right out of the blue. Thank goodness someone had picked up the trail of emails and correspondence and had the foresight to send me a copy. I now know that the book is published and has my art on the front of it. Finally, I have my precious copy. 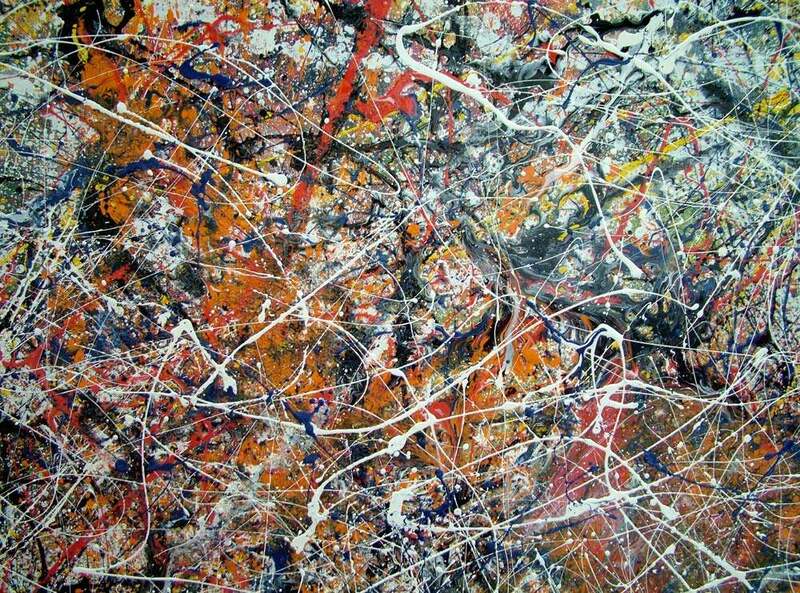 The very aptly named ‘Big Bang Theory No.2’ is the painting that adorns the cover. 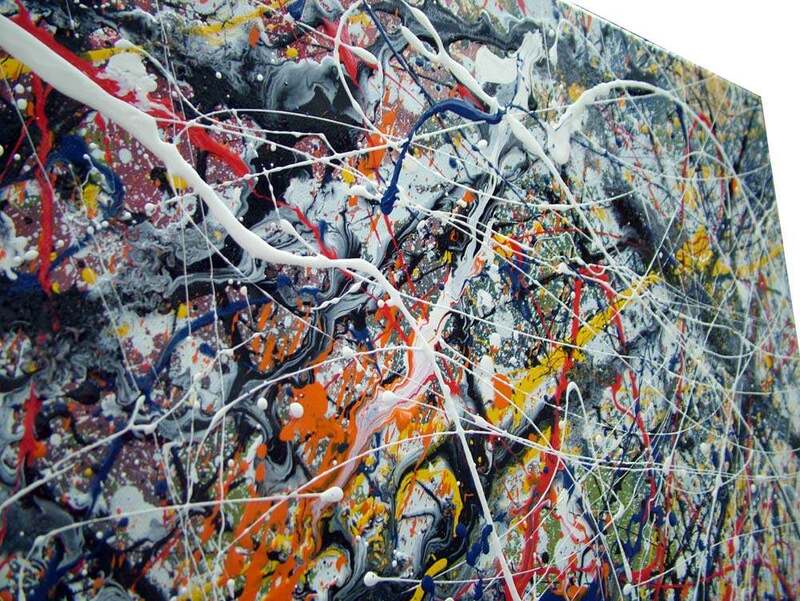 It was painted in late 2011 (I think?) and I can’t remember where it went or what I did with it to be honest. 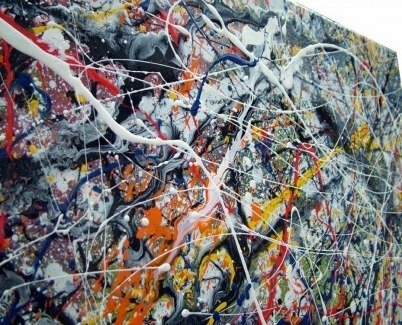 What I can tell you is that I remember painting it very clearly – at the time I was using a large paddling pool in my second studio and this was for the purposes of containing paint that got thrown and splashed around. It was painted using my beloved enamel paints and was one of the first pieces to use the needle and syringe method to get the fine details on the underpin and middle layers. I am no physicist or mathematician but I love physics. From planets to particles and every theory and principle in between – it’s been a lifelong fascination for me. As I get older I become even more curious about the world and universe around us and the desire to understand how everything works. So it’s not without a sense of irony that my first book cover should be about a scientific subject. And here’s another twist: the author (Piers Coleman) was born in my home town of Cheltenham (UK) before forging a highly successful career in the US. You just can’t make this stuff up! 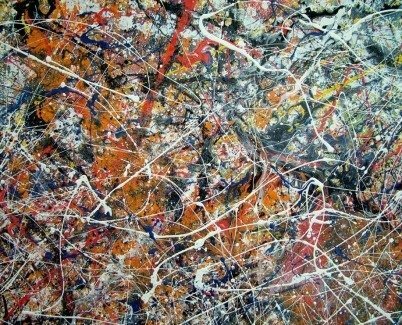 And for the painting to be actually named after one of the most significant and controversial theories in history really just pulls the whole thing together. It just couldn’t have worked out any better. So it’s not going to top the New York Times Bestsellers list or win the Pulitzer prize but that’s not the intention of the book. It’s an educational resource, a graduate-level barnstormer of a publication that may just become an integral part of somebody’s growth as a physicist that propels them onto solving the greatest questions mankind can ask. You can ask no more of a book than that. And I am immensely proud to have made it look pretty good from the outside. I want to thank you for allowing Cambridge University Press to use “Big Bang Theory No. 2” as the cover of my book. Your work is not only aesthetically pleasing, but it also appeals because it captures the idea that physics, nature, have structure at every scale. The lines are reminiscent of the patterns particles make in a detector, they also evoke Richard Feynman’s famous diagrams that capture the way quantum particles interact, both in the vacuum and inside dense matter. I hope that this is just the first of interactions and collaborations between your creative art, and the science community. Thank you so so much for taking the time to get in touch. You’ve no idea how much your words mean to me. 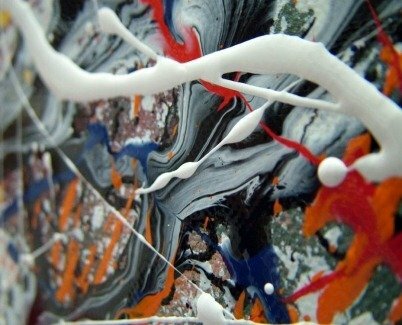 The joy and wonder of the very small and the very big has been a lifelong fascination and, although my understanding is basic to say the least, I use my love of scientific principles and observations in many of my artworks. For you to reference that is perhaps the greatest compliment I could receive. I am genuinely humbled Piers, thank you. Let’s hope I can develop other opportunities to share my creativity; in the future. My very best wishes and gratitude to you.